I am a proud owner of the latest generation of fpgaarcade.com replay boards, including a nice development breakout-board. Although it is intended to be used as "next generation" Minimig platform with many new (and modern) features like DVI/HDMI/VGA output, it is by far the best platform available today for implementing arcade board designs. On the right side you can see the board "in action", while connected to my logic analyzer and a special development break-out board on the top. I'll release all the code I design for it, but I'll carefully check with Mike (who invented and designed these boards) / Jakub (working on the Minimig code). My intention is to extend the platform, not to work against it. As the current development of the replay implementation is in a "heawy rework phase" (of FPGA code and all ARM code), I'd like to wait until these guys finish their job - and I try to help them where I can, like my proposal for an alternative ARM bootloader. For now I am checking out each functional part of the replay board. I have to thank Mike here, as he is supporting me in my first steps getting the board up and running. With the help of some code he gave me, I was possible to set up the video and audio system to show a test picture including some test tone. Meanwhile, I already released the source code of some sub-parts of my development, as it might be used also for other FPGA projects. Just click on the fpga project item in the navigator window to check them out. These parts are also used on my own replay implementations. And of course there are my arcade replay and my computing replay projects you can open using the navigator buttons on the left. Please contact Mike via the fpgaarcade.com homepage if you are interested in a board or in development for the board, I am sure he will help you as he does for me! Some (or better most) arcade games require a ~15kHz horizontal frequency capable monitor to get the "real" arcade feeling. Nearly all older and modern TV are good for that, but nearly no computer monitor! Unfortunately, even TV with DVI or VGA input do not accept such a signal over this channels, as it is far outside the VESA specification. One way around that is "scan doubling", so transmitting two times the same line at ~30kHz to make the video signal "VGA compatible". I think thats a way of "cheating" and not really needed, if you use a regular TV set: there is usually also a SCART input available! The connection diagram is shown on the left. It should be compatible with TV sets with RGB SCART capability. Of course I can't guarantee that it works with your setup as well. As mentioned, it requires a proper replay setup. The games I implement on the board support this mode on DVI, in parallel it is also possible to check the picture on the composite-out of your board (if you have this add-on). Also take care when soldering the cable! A wrong connection in the cable may damage your replay board, your television set or even both! So think twice before each step, check your setup before using it, in case you don't get a picture immediately switch the board off and disconnect the cable! 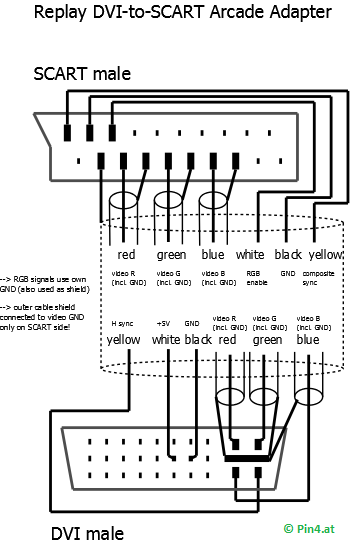 It is also highly recommended to check the SCART pinout in the manual of your TV set - if the naming is different, you should not try it at all!